Members of the genus Adelges are distinguished by having five pairs of abdominal spiracles, whereas members of the other genus of Adelgidae, Pineus, have only four distinct pairs. 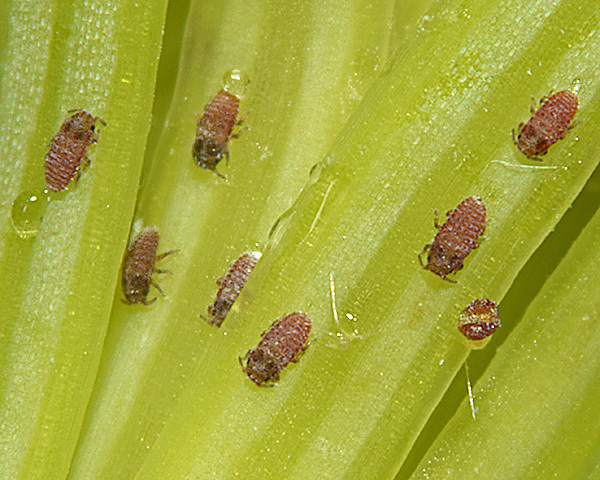 Adelges aphids are often identified from the shape of the galls on the primary host (spruce) which are cone-like, sometimes resembling miniature pineapples. 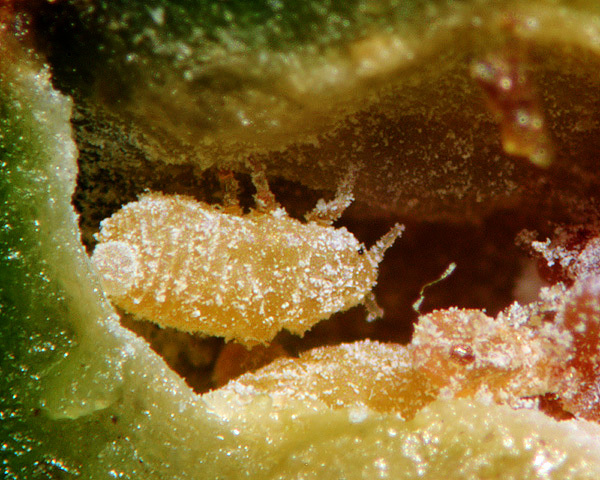 Forms on the secondary host often produce abundant wax. There are about 30 species of Adelges worldwide. 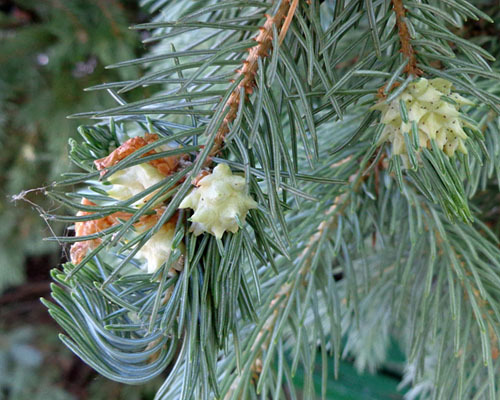 The primary host of species with a sexual stage in their life cycle is spruce (Picea), and the secondary hosts are fir (Abies), larch (Larix) and other conifers (but not pine). The complete life cycle of these species takes two years. Several Adelges species have lost sexual reproduction and host alternation, and instead live all year on spruce or on (what was originally) its secondary host. The Adelges abietis gall on spruce, known as a 'pineapple gall', (see first picture below) is ellipsoidal with its length less than 1.5 times the width and usually about 15-20 mm in length. 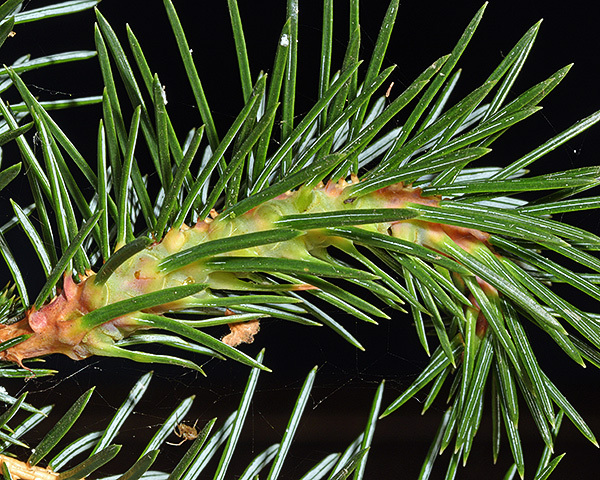 The spruce needles on the gall are shorter than normal and are a slightly paler green than on a normal shoot. The slits to gall chambers are often orange-red or deep pink before opening. There are often several galls together at the base of adjacent shoots, and plant growth often continues beyond gall. The gall is initiated by the pseudo-fundatrix (not pictured) which is yellowish-green to light green with 5-segmented antennae. The offspring of the pseudo-fundatrix which live inside the gall (see second picture below) are a yellowish orange and are densely waxed. The gall chambers open in August-September to release the gallicolae. The Adelges abietis gallicola (see third picture above) is yellow with 5-segmented antennae and five pairs of abdominal spiracles. 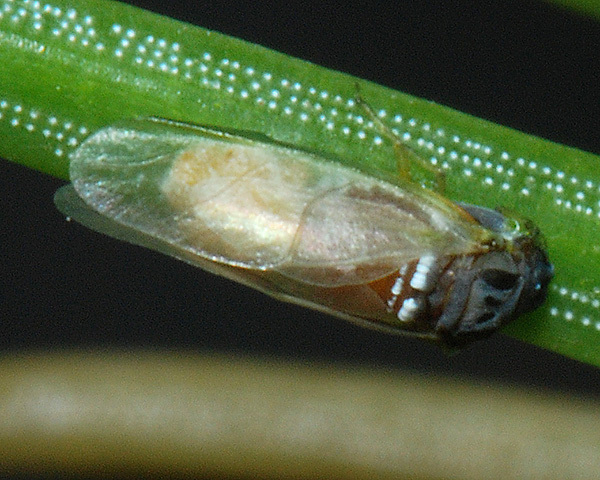 The eggs laid by the gallicolae hatch to give 'crawlers' which overwinter close to buds, and then mature in spring to the wingless pseudo-fundatrices. 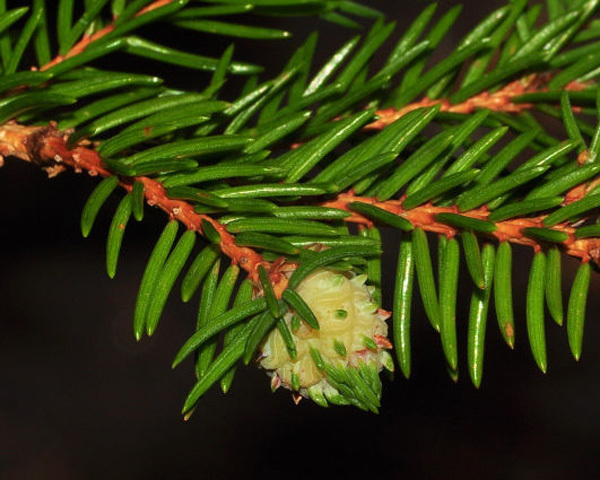 The pineapple gall adelgid is mainly found on Norway spruce (Picea abies), but it can also occur on other Picea species including sitka spruce (Picea sitchensis) and white spruce (Picea glauca). 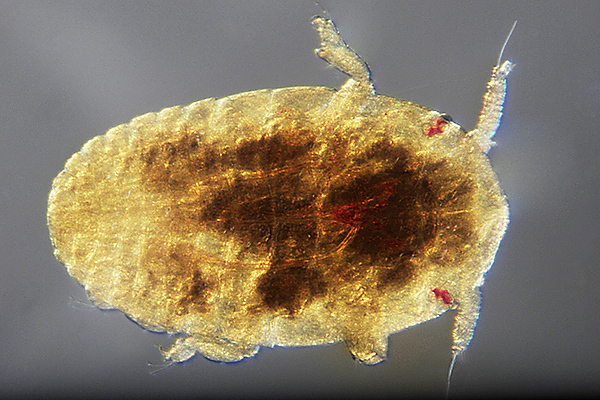 Unlike many of its genus, Adelges abietis does not host alternate, and only has two morphs: the apterous pseudo-fundatrix, and the alate gallicola. Sexual forms are unknown. Whilst its original primary host was presumably spruce, the pseudo-fundatrix does not hatch from a sexually-produced egg. Adelges abietis is distributed throughout Europe, and is also found in Morocco, India and North America. The Adelges cooleyi gall (see first picture below) is elongated, more than 1.5 times as long as wide, and often curved with the needles slightly shorter than usual (cf. Adelges laricis & Adelges abietis which have globular or ellipsoidal galls, less than 1.5 times as long as wide, and with needles much shorter than usual). Adelges cooleyi galls are highly variable in colour: yellow-green, pink, red or even deep purple. The gall is initiated in spring by the fundatrix which feeds on sap and matures, inducing a swelling of the bud into a gall. At maturity she produces a cluster of eggs which hatch to give brownish nymphs which crawl into the developing gall. 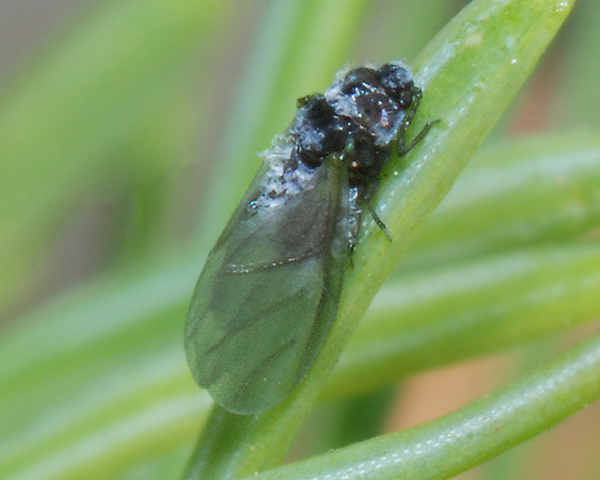 The galls release winged females, the gallicolae (see second picture below) which migrate to Douglas fir. The gallicolae of Adelges cooleyi have reddish brown to purplish black abdomens and reddish brown wing veins , and are somewhat larger when originating on spruce (length 1.7-2.5 mm) than on Douglas fir (length 1.2-1.7 mm). Antennal segments III and IV are carrot shaped, and have slit-like rhinaria. The rhinaria extend slightly more than half way round, but do not occupy more than 25% of the length of the segment (cf. Adelges nordmannianae where the rhinarium on III is almost half the length of the segment and extends more than half way round it). 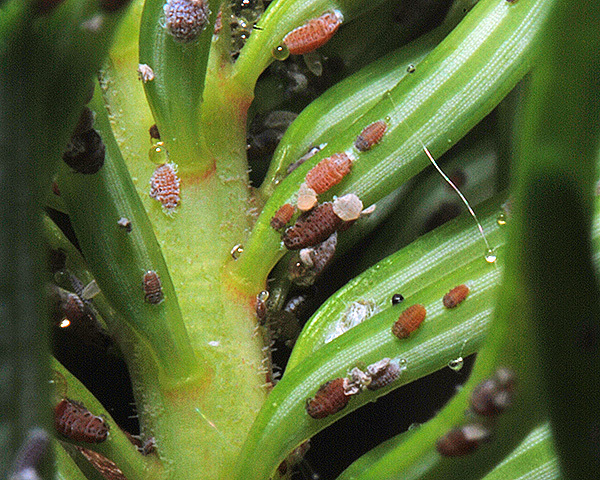 The eggs of the gallicolae hatch out to give apterous exules and these overwinter on fir. These develop the following spring when they become covered in white woolly wax (see third picture above). The offspring of mature exules develop to give both wingless and winged forms, and the winged forms migrate back to spruce. Their offspring develop to males and females, and the mated females lay eggs. These hatch to give young fundatrices which overwinter on the spruce buds. 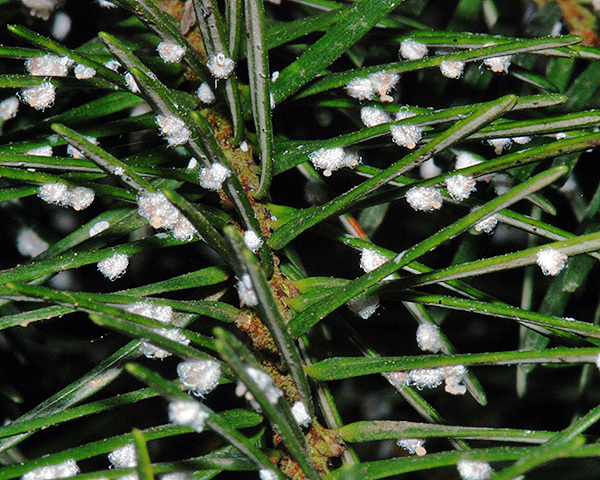 The cooley spruce gall adelgid typically has a two year life cycle alternating between spruce (Picea sitchensis, Picea pungens, Picea engelmannii) and Douglas fir (Pseudotsuga menziesii, Pseudotsuga macrocarpa). Host alternation is sometimes lost and the species remains on one host all year round. 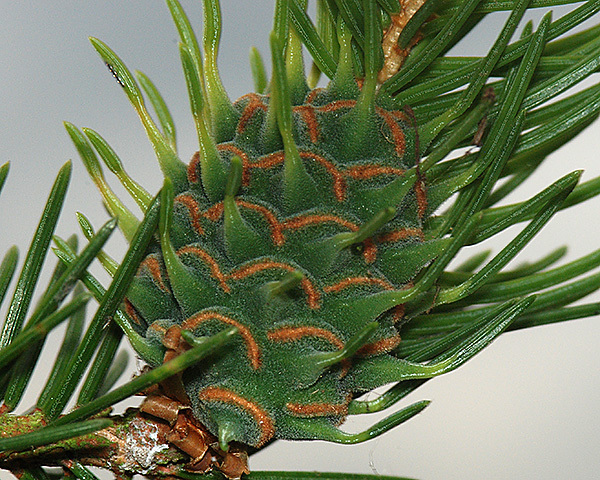 For example a form in Canada remains on Picea glauca, and forms in Europe and California remain on Pseudotsuga. Adelges cooleyi is native to western North America, but is now found throughout Europe and North America. Adelges laricis galls on spruce (see first picture below) are waxy, creamy and relatively small. These galls mature in June-July. The winged female gallicola of Adelges laricis (see second picture below) which matures on spruce is greyish to blackish, with a body length of 1.9-2.0 mm. Antennal segments IV and V of the gallicola do not have deep constrictions at the articulating surfaces, so that segments III to V appear fused. The rhinarium on segment III is narrow and angular. Each rhinarium extends at least half way round the circumference of its segment. The gallicolae migrate to larch where they lay eggs. First image courtesy AfroBrazilian under a Creative Commons Attribution-Share Alike 3.0 Unported license. 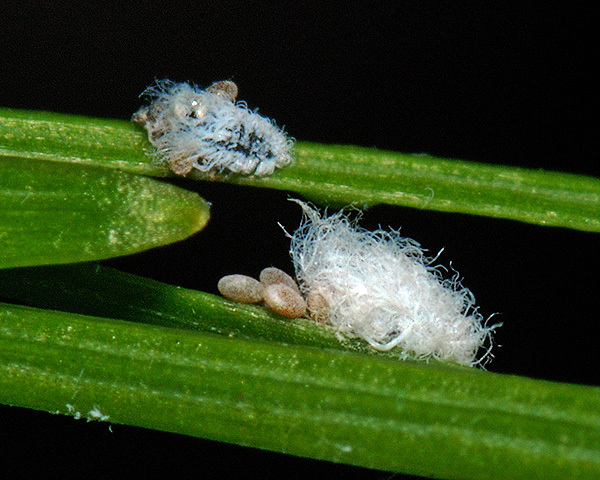 The eggs hatch to give blackish-grey apterous sistens females which on maturity lay large clusters of eggs. These develop to give wingless and winged exules which are covered in white woolly wax (see third picture above). The winged female that matures on larch is dark green, with a greyish-green head and thorax and a body length of 1.0-1.5 mm. The winged females migrate back to spruce and lay eggs which develop to sexual forms. 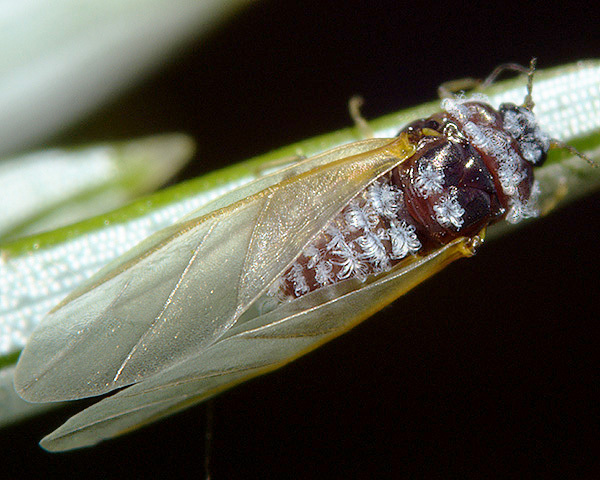 After mating eggs are laid which hatch in autumn. The larch adelgid host alternates between the primary host Picea (spruce) and the secondary host Larix (larch). The larch adelgid was originally found in central Europe, but Adelges laricis is now widespread throughout that continent and has been introduced to North America. Adelges nordmannianae induces terminal galls (see first picture below) on its primary host, oriental spruce (Picea orientalis). The galls are 2-15 mm long, globular, pinkish, strawberry-like when young, but later becoming greenish with red or purple coloration at the bases and tips of scales. 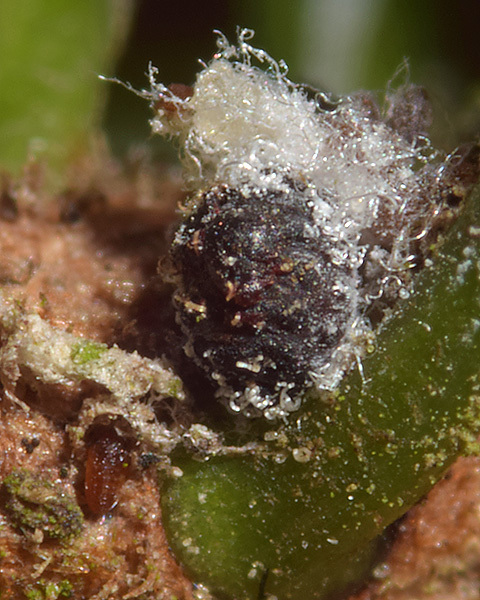 The gallicola of Adelges nordmannianae which develops in the gall (not pictured) has the body and wings at first greenish, darkening in a few days. The antennae have large rhinaria on segments IV and V which extend half the length of the segment, or even more in the case of segment IV. Segment V is much narrower than the other segments and distinctly cigar-shaped. The rhinarium on III is almost half the length of the segment and extends more than half way round it. Adult body length is 1.1-1.54 mm, body width is 0.55-0.66 mm. The secondary host is fir (Abies). 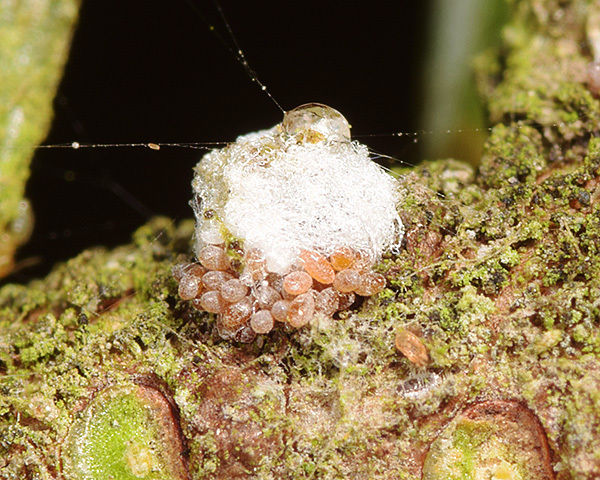 Nymphs overwinter on fir and on maturing deposit clusters of brownish-orange eggs. These hatch at bud-burst and the reddish brown 'crawlers' disperse over the young needles (see second picture below). The first instar larva of the sistens morph (the overwintering neosistens stage) is the stage often used for identification purposes. The wax pore plates on the inner margins of meso-- and metathoracic spinal sclerites contain numerous small rounded pits, arranged in 2-4 areas, the most central area containing 7-12 pits. The total number of pits in the central areas of the spinal wax pore plates of the meso- and metathorax together with abdominal tergites I-III (i.e. 10 central areas) is 57-104 (cf. Adelges piceae which has 18-63 pits in the 10 central areas). There are then several parthenogenetic generations of multiplication with both apterae and alatae produced. The third picture above shows mainly immature alatae (unwaxed) and a few apterae (waxed). Where the primary host is present (Caucasus mountains in Russia & Turkey), Adelges nordmannianae has a two year life cycle, host alternating between its primary host, oriental spruce (Picea orientalis), and its secondary host, Nordmann fir (Abies nordmanniana). On its primary host it produces small rounded terminal galls. The winged forms that emerge from the galls migrate to fir where it has a series of parthenogenetic generations. The adelgid has been introduced to much of Europe, North America and New Zealand where it is anholocyclic on a variety of secondary hosts, including Nordmann fir and silver fir (Abies alba). Redfern, M. & Shirley, P. (2002). British plant galls. Field Studies 10, 207-531.